Missing Teeth? Dental Implants in Long Island City to the Rescue! Have you been living with missing teeth and desire to be fully restored? Your local dentist says the best way to go about achieving this is with dental implants in Long Island City. As you read on, you’ll learn how the process works and why it’s the best option for a total restoration. Dental implants are surgically inserted titanium posts that act as the roots of your missing teeth. Titanium is the most common material of choice because of its biocompatibility (it fuses well with your natural underlying bone structure) and its durability. As the fusing with your jawbone proceeds and the healing process continues, a sturdy foundation is formed. After an initial period of healing transpires, you’ll return to your dentist to have one or more abutments affixed that will allow for either a crown, bridge or implant-retained dentures to be attached. Once the prosthetic is in place, you’ll be fully restored. Dental implants offer the closest resemblance to the natural function of your teeth roots. That’s because they attach to your underlying jawbone, which provides a strong foundation to support your facial structure. Thus, you won’t have to worry about any collapsing or premature aging due to advanced wrinkling. Eat the Foods You Love – One of the unfortunate things people with missing teeth have to deal with is the inability to eat many of the foods they love. With a fully restored set of teeth that will no longer be a problem. Speak Clearly – It’s easy to take for granted the fact that you can speak clearly. When teeth are missing, though, it quickly becomes apparent how necessary they are in pronouncing words correctly. With your new implants, you’ll enjoy improved speaking. Aesthetic Appeal – It’s very common to experience a loss in self-esteem when your teeth are missing, leaving you reluctant to smile for photos and less confident when meeting new people. Dental implants help to paint a new picture of life, though. Bone Loss Prevention – When there’s an absence of teeth providing tension, your jawbone begins to produce less new bone cells. This can cause a chain reaction of events where more of your teeth can begin to fall out due to the decreased bone mass. Better Overall Health – Studies have found that when people’s oral health is in better condition, it tends to have a positive effect on their overall wellness. 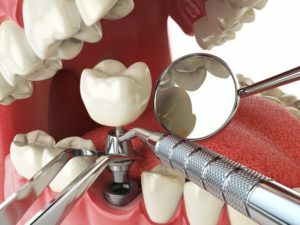 Thus, having your missing teeth replaced with the best method of restoration available means that you’ll benefit in ways you may have never imagined. Living without the full function of your teeth does not have to remain your reality. With the help of your dentist in Long Island City, you can once again experience the joys of having excellent oral health and a fully operational set of teeth! Dr. Steven Bizzell earned his dental degree from the University of Louisville School of Dentistry and has been providing expert care for over two decades. Additionally, he is a Diplomate of the American Board of Periodontology, with qualifies him to specialize in periodontics and implant dentistry. Dr. Bizzell practices at LIC Dental Associates and can be reached for more information through his website.